The M'Zab Valley is a region of the northern Sahara that holds five traditional fortified villages (ksour), an intact example of traditional human habitat perfectly adapted to the environment. The Ibadis settled here from the 11th century on, making the most of the defensive possibilities. Their settlements included palm groves where they built a summer citadel (used during the seasonal migrations). Site visited December 2013. My visit to M'Zab Valley WHS could be categorized ’nearly missed’ due to the riots that took place in Ghardaïa that time. But I consider it as visited though not extensively. In many aspects my visit became totally different than I had expected. There were lot of things that went wrong on my trip. The problems started already when I flew from Constantine to Ghardaïa via Algiers. Air Algérie is notorious for its unreliability and I fell victim to that. The whole story is too long to tell here but all I want to say is that it was very eventful travel day. I was lucky that I made it to the Ghardaïa plane just before its departure. I was happy when I arrived late in the evening in Ghardaïa but I was totally unaware what waited for me there. At the airport the policeman escorted me to the taxi. The hotel staff was a little bit surprised when they saw a tourist. Next morning they made it clear that they don’t let me out of the hotel on my own. They told me that the situation is very serious and it is not safe to visit the famous ksours. The receptionist said that there has been violent ethnic clashes between Arabs and Mozabite Berbers. She told that people throw cobblestones to shop windows, burn houses and dig bodies from the graves. There had been fatalities. The receptionist also said that she don't understand why this place is supposed to be some kind of tourist destination because it is a war zone. I had to wait in my room until it was safe to go out. In the afternoon the taxi driver took me to Beni Isguen which was at the time the safest of the inscribed ksours because it has mainly Mozabite population. I went to a tourist office and got a obligatory guide who walked with me around the old village. It looked peaceful in Beni Isguen yet the streets were quite empty. It is forbidden to take pictures when there is people, especially women, on the streets. The guide told me every time when it was allowed to take a picture. It was exiting to walk on narrow alleys. The houses and walls had organic and round shapes. Main colours are yellow, pink and red. On the summit of the hill there is a mosque. After Beni Isguen we went to Ghardaïa market square. There was a big mess. Many windows were broken and some of the shops had been burnt. On the ground there were piles of cobblestones, garbage and empty canisters. Near the market square there was also a burnt car. Next we visited in the gates of Bounoura. It was too risky to go inside. The taxi driver looked very anxious all the time. He said that it is war going on here and he is responsible for my life. All we could do was just drive around the ksours. Later in the evening we went to Beni Isguen market but it was almost empty. Most of the shops had been closed. Luckily there was one shop open so I could buy some unique handicrafts. Other thing that surprised me was the weather. Whole of my visit it was freezing cold, cloudy and it was raining almost all the time. I have to put on many layers of clothes but still I was a bit cold when we walked outside. M'Zab Valley is one of the most interesting World Heritage Sites in Northern Africa but the long lasting ethnic unrest makes this place a bit unpredictable. At least my short visit was disappointing. I saw the potential but I couldn’t enjoy the visit. I could imagine that in peaceful times and good weather M'Zab Valley is a unique experience. Maybe one day I'll go back and see all the things I missed during my unlucky first visit. On a Friday there are no official guides at the entrance gate of the old city of Ghardaia, nevertheless it is compulsory, and I have to ask the help of the military and police officials. But luckily some diplomats from Algiers showed up, and I was able to join them, not only for Ghardaia, but also the sister village of Beni Isguen; we walk up to the local mosque, always the highest point of a Mozabite town. The paths are very narrow, good for donkeys, but nothing else. In summer time when the temperatures rise to above 50 degrees, the locals relocate to the palm oasis below. We also visit the cemetery where ‘another one bites the dust’ does not have to be further explained, there are no graves, no flowers, just stones and sand from the Sahara. Beni Isguen is home to the Mozabite women, clad entirely in white, and revealing only one eye to the outside world. The 5 inscribed towns of the M’zab valley are, despite the lack of tourists currently visiting Algeria, one of its (relatively) “honey pot” sites and about the only place where we met other tourists in Dec 2012. What draws them is primarily the feeling that one is entering a closed society as evidenced in both the design and architecture of the towns and the culture of their people. The architecture is regarded as having influenced a number of modern architects – particularly Le Corbusier who visited in 1931 and 33 (at least, since he spent a lot of time in Algeria). The culture is that of the Mozabite people - a Berber tribe, most of whom are Ibadi Muslims. They reached the M’zab valley around 1010 AD after being expelled by the Sunni Fatamids from their earlier home in the north which had become Ibadi around 770 AD under the Rustamid dynasty which had a Persian origin (today the World’s largest Ibadi community is in Oman). The circumstances of their choice of M’zab came about from the need for defense and security – the hills above the valley are still scattered with watch towers, the towns are designed as fortresses and partaking in the overnight guard duty is still an important aspect of Mozabite male culture. They remained independent through to the 19th C, first concluding an agreement with France in 1853 to maintain it and finally succumbing in 1882. Ibadi religious belief favours “dissociation” from (but not hostility towards) those who don’t share their world view. We felt we gained greatly from having a Mozabite guide with us all the time – the non-tangible aspects of Mozabite culture interact significantly with Mzab’s visible sights but you need explanation and discussion to understand both. 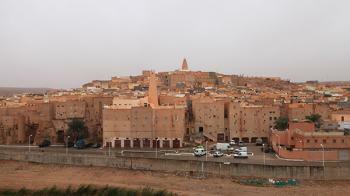 Across 2 days we visited 4 of the towns and also paid a visit out to the Date Palm Groves of Ghardaia. In theory, one is not allowed to enter the towns through the limited number of gates in the walls without a local guide – notices to that effect are at every gate, though guides are only available at the “main” entrance”. Our Mozabit guide throughout Algeria happened to be from Ghardaia but he was still punctilious about picking up a guide from the guide office (who actually added little to what he said) apart from a quick traverse we made through Melika and the visit to the date palm groves – where we visited that one belonging to his family. A male in inconspicuous clothes might get away without a guide (not all men wear the traditional “baggy” trousers!!) but I wouldn’t bank on it and it is perhaps a site where a guide can be useful. A female is going to stand out like a sore thumb as all the local women go out totally covered in white with just a small gap for one eye! We were told that the “guide” rule even applied to Algerians from Algiers. The other “rule” which is applied somewhat aggressively at times is “no photography of people” – especially the ladies in white. This can be interpreted as meaning even if they are 100 metres away and you are photographing a building. Some of the ladies are accompanied by family “minders” and, on one occasion, there was a slightly tense situation where one of our small group was made to delete a photograph for just having taken a “long shot”. You will have to make up your own mind about the legitimacy of their desire not to be photographed in the streets of their town and whether (as is possible) you try to break the rule! The Boulila tower at the summit can be entered and climbed – giving a fine view over the whole M’zab valley. The market square just outside the city walls is the valley’s prime “tourist shopping” area – mainly carpets and dates! Inside the walls are yet more alleyways and arches leading up to the biggest of the minarets – but this one can’t be climbed. After having seen 3 towns already we found the trip out to the town’s date palm groves (each town has its own) of more interest (c 2hrs with lots of explanation about the “social background”. The palm groves are maintained by an irrigation system which moves water underground through the groves and divides it according to the numbers of palms, This, like everything else in M’zab, is maintained and run by a complex social system of shared actions and responsibilities – the Mozabites operate at least partially outside the secular Algerian state when running and policing their society. Although the palm groves were originally only inhabited during the summer and autumn harvest period, the pressure of population etc seemed to be ending that practice. A notable sight was the high water mark of the disastrous flood of 2008 which reached 2 metres – signs of destruction of buildings and palms were still widespread. On the whole the tangible “sights” at this WHS were less noteworthy than I had hoped and expected, but the UNESCO web site comments that they are “the achievement of a group of human beings defined by clearly defined religious, social and moral ideals.” To get the most from the site it is worthwhile trying to discover this latter aspect - the 2 elements combined make it an interesting and worthwhile visit. My visit here was in 1991 so memories have faded somewhat after more than 16 years. I do know however that this is one of the most interesting areas in Algeria and should be on the itinerary of anyone visiting the country. 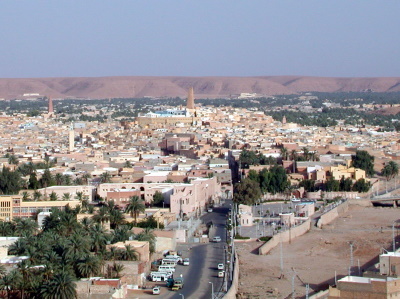 Five small towns, of which Ghardaia is by far the largest, sit in a valley surrounded by barren desert.The valley has thousands of palm trees and a complex water supply system. I also visited two other of the towns, Beni Isguen and Melika. The people here tend to have held themselves apart from the main current of Algerian history and are Berber with conservative religious views. The men wear (wore?) the low hanging baggy trousers as seen in parts of rural Turkey while the women dress in an allover white garment folded in such a way that only one eye is visible. Each town stands on top of a small hill with its mosque, usually with a distinctive pyramidal minaret, at its centre. Most of the buildings are cream painted and well maintained. There are alleyways and daily markets (in which dates figure very large) to explore and in Beni Isguen a museum of local life. Locally painted signs advise the visitor on the modest dress expected to be worn. Not many laughs here perhaps but with an atmosphere unlike anywhere else I saw in Algeria. Walled cities: "Each of these citadels, encircled by walls...." (AB). Individual Rivers: Wadi M'zab (Mzab River). The region has taken its name from the river. 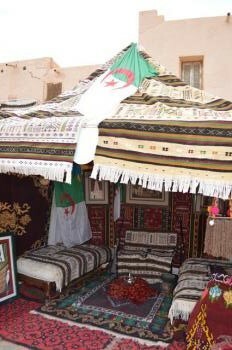 Berbers: The local language of the Mzab is Mozabite (Tumẓabt), a branch of the Zenati group of Berber languages. Palm Groves: Crit v "The elements constituting the M'Zab Valley are an outstanding example of a traditional human settlement, representative of the Ibadis culture that, through the ingenious system for the capture and distribution of water and the creation of palm groves, demonstrates the extremely efficient human interaction with a semi-desert environment. Poetic Quotations: Simone de Beauvoir "C'était un tableau cubiste magnifiquement construit : des rectangles blancs et ocre, bleutés par la lumière, s'étageaient en pyramide; - la pointe de la colline était fichée de guingois une terre cuite jaune qu'on aurait crue sortie, géante, extravagante et superbe, des mains de Picasso.."